Suspensions and bouncing back and forth between various schools, crack- addicted parents and grandparents, running away, physical abuse, early fatherhood (age 17), teen-age drug use, multiple arrests, several incarcerations in local, county and state jails and prisons, kicked out of the house, periods of homelessness, failing to show up for court-assigned drug treatment programs; and now; the Program Outreach and Retention Specialist for Restoring Our Communities at Laney College. Vince Garrett is the poster child for both what can happen to young people living in precarious circumstances and simultaneously for how the right combination of treatment, education, inspiration and opportunity can help someone not only turn his life around completely, but also become an model and exemplar of what might be possible. Now 42- years- old, Garrett is a father and grandfather, working with formerly incarcerated students at Laney. 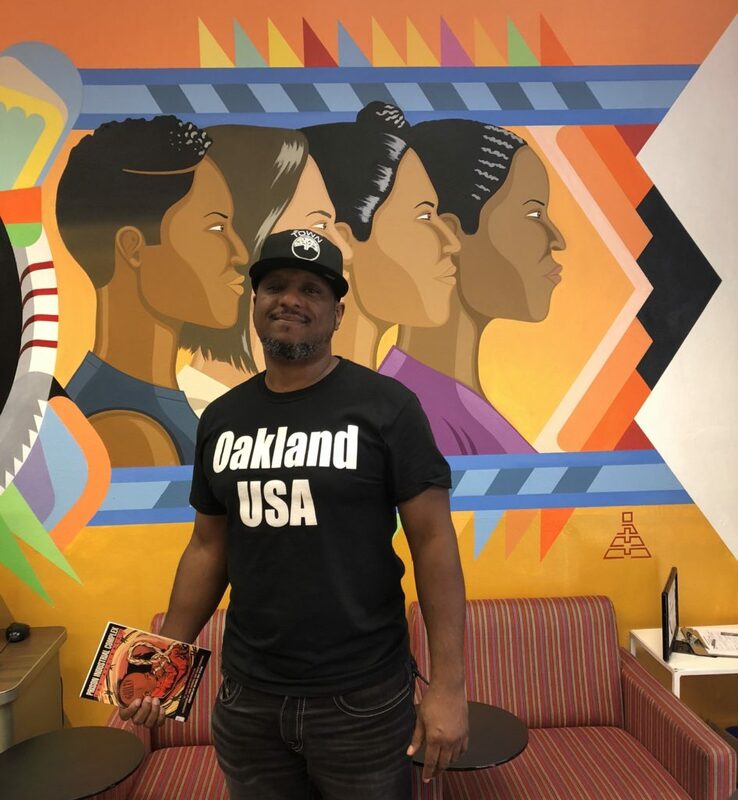 His life, growing up in East Oakland in the 80’s and early ‘90’s, was a perfect storm of unfavorable conditions, beginning with his parents and step-parents, themselves struggling with drug abuse and often abusive. He began acting out in the various schools that he would be suspended from and transferred to other schools. These were among the factors that created the almost foregone conclusion that Garrett would start using weed by the ninth grade, run away from home, eventually sell heroin and crack on the streets, and, inevitably get arrested. As Garrett recalls it, he often missed classes at King Estates, a junior high in the 80’s (now a middle school.) There was a great deal of schoolyard violence among both boys and girls. His mother transferred him to Hope Academy, part of the Center of Hope Church, but he eventually wound up at Montera Jr. High, graduating at the age of 16. In the middle of all this, he was identified as a GATE (Gifted and Talented Education) student, but mostly did poorly due to truancy. At this point, he became a father at the age of 17; the mother, a girl only 13 years old. Garrett was living with his father and the girl and their newborn son was living with her mother. He was then enrolled in Skyline and should have been in the graduating class of 1995, but his involvement in selling drugs starting escalating. Just after turning 18, he stole his grandmother’s car, crashed it while driving drunk, and was homeless for a period of about a month. About this time he was first arrested for drug possession. He was released on his own recognizance for a couple of days but didn’t show up for court. A warrant was issued for his arrest; he was caught and then released on a drug diversion program. A few minutes late to the first class, he was not allowed to enter so he decided not to go back, resulting in another warrant, arrest and jail time. This began a cycle of arrests, jail time, releases, and probation violations, from Santa Rita to San Quentin. At the same time, he got his G.E.D., had a second child, a daughter with another woman, with whom he lived briefly,. They were both selling heroin, though the woman was not using. Garrett was helping to support both children, when he could, with money earned from illegal drug sales throughout most of 1995. He managed to stay out of jail for most of 1996 until a “dirty” drug test landed him back in jail for 30 days, and so began another cycle in and out of prison until 1999. Garrett then began attending College of Alameda, in 2001, and also had a third child at that time, with another woman. He became a drug counselor after finding he had a gift for working with people, such as the time when a white guy was disrespectful to someone at a meeting. Garrett pulled him aside, and within minutes, the man was sobbing, revealing he had recently lost his mother. But counseling didn’t pay enough, so in 2004, he joined the International Brotherhood of Electrical Workers while taking classes at an apprentice training program. He was laid off in the recession of 2007. He became a non-union laborer, finding work where he could, but it was often intermittent. A three-year marriage to another woman (not the mother of any of his three children) failed when money shortages led to irreconcilable differences. At this point, in 2011, Garrett enrolled in Merritt College, got his A.A. in business, as well as behavioral sciences before transferring to U.C. Berkeley and getting his B.A. in Sociology in 2016. While at Berkeley, he became involved with Street Scholars (later Underground Scholars Initiative), one of several programs working with the formerly incarcerated. 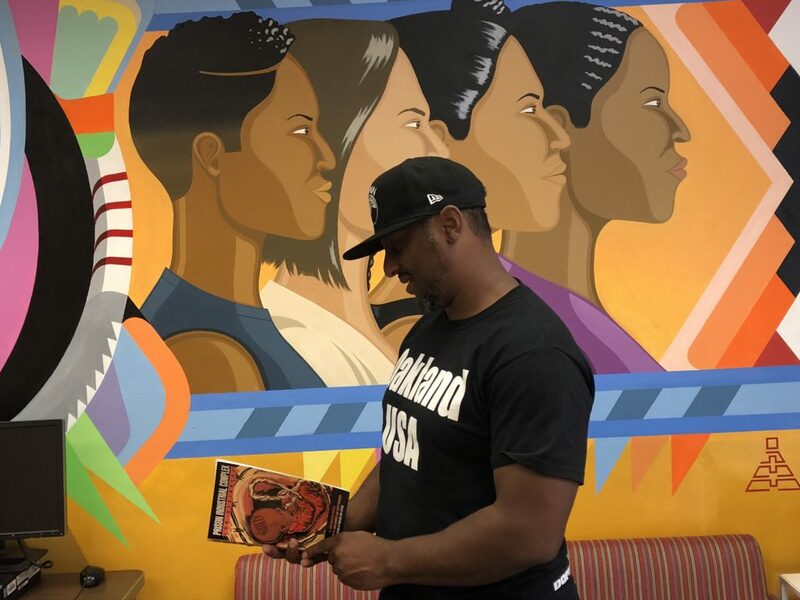 Now working on his Master’s of Organizational Leadership at University of San Francisco, he is philosophical about the life experiences that led to his selling drugs, dropping out of school and incarceration. He sees them all as stepping stones to his current work with Restoring Our Communities (ROC), where he started immediately after his graduation from U.C. Berkeley. In his current position, he is able to completely empathize with the students who are part of the ROC program, which provides a range of academic supports to formerly incarcerated – as he notes, from CTE (Career Tech Ed) to Ph.D. Students may need support with food insecurity, where they can receive $8 per day food vouchers for the Laney cafeteria, and support with housing referrals, although Garrett notes that there is a lot of work to still do in the area of housing. Garrett sees himself as, in his words, “the guinea pig,” a successful student who was formerly incarcerated. He is living proof that despite multiple setbacks, bad decisions, bad luck, bad timing and periods of despair, anyone can regroup, reflect, rebuild and ultimately become an inspiration to others.